In his 40 years of political service, Chris Carlson saw many things. Now he’s ready to share the most interesting parts. Carlson is currently on tour promoting “Medimont Reflections,” in which he shares his opinions in 13 chapters (he passed through the Wood River Valley earlier this week). Topics include the failure to restore salmon and steelhead populations, campaigning for the breach of four dams in the lower Snake River, gun control, abortion and nuclear waste. He also writes about the Northwest Power Planning Council, for which he was its first member. Carlson expresses a few issues with the council, claiming that it has failed in its major mission in protecting and enhancing wild salmon and steelhead runs in the Columbia River basin. “The Power Council has been for a number of years totally irrelevant in the discussion of the region’s energy future; totally has failed to meet its fisheries enhancement and protection mandate; and, has been searching for a new mission for a number of years now,” he said. ville Power Administration has wasted $7.35 billion over the first decade of this century to try to restore and enhance runs of wild salmon and steelhead. As Carlson explores some behind-the-scenes experiences, he also touches on the Mormon influence in Idaho politics. In an essay, Carlson explains the campaigns of Larry Echohawk and Mitt Romney as influences the Mormon Church can have in Idaho elections. Carlson also devotes a chapter to the 1956 race for the U.S Senate between Glen Taylor and Frank Church. Historical documents notwithstanding, Carlson speculates that there was possibly a cover-up with a stolen ballot box that changed the outcome. Carlson claims that 1956 was not only a controversial year in the U.S. Senate race, but also a landmark year for the women’s movement. In that year, Gracie Pfrost and Louise Shadduck ran against each other for Congress. With controversial topics aside, Carlson dives into the creation of the Hells Canyon National Recreation Area and Morley Nelson Snake River Birds of Prey National Conservation Area, in which he adds some interesting details with his relationship with a couple of celebrities. Carlson recalls how actor Paul Newman visited Idaho because of his intense interest in the World Center for Birds of Prey. Newman supported the effort for a sanctuary. Carlson also cites how actor Robert Redford was involved in the project and played a crucial role. Before Carlson, a Democrat, got into politics, he was a reporter in Washington and Idaho in the early 1970s and also taught at Kootenai High School. He said that his new book is heavy on politics but believes readers who do not follow politics will enjoy it. He discusses former Idaho Gov. John Evans and gives him praise. Evans became the governor in 1977 when Andrus became President Jimmy Carter’s secretary of the Interior. Carlson was taken with Andrus to Washington, D.C., that same year. Evans served for 10 years and between Andrus and Evans, the duo had an improbable Democratic grip on the governor’s office for 24 years. Idaho democrats haven’t come close to that dominance since (Andrus declined to seek a fifth term in 1994). Carlson’s fond memories of the way politics used to be is noted when he recalls a nicer political landscape when Republicans and Democrats celebrated when Andrus was named Interior secretary. After Carter was defeated in 1980, Carlson couldn’t find any employment. That was until Evans gave him another shot when he appointed Carlson to the Northwest Power Planning Council. 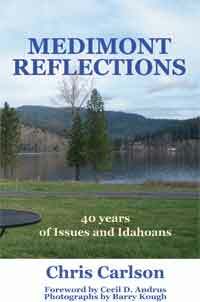 “Medimont Reflections” has been published by Ridenbaugh Press.